This map shows a new configuration for accessing westbound Interstate 70 from the Vail Town Center, or main, interchange in town. The new configuration will be in place as of mid-day on July 25. The new configuration â which will be used for a week, then re-evaluated â is an effort to ease congestion on the south frontage road between 4 and 6 p.m.
VAIL — Beginning mid-day, Monday, motorists at the Town Center Interstate 70 interchange at Vail will be directed into a new lane configuration that will add additional capacity for commuters accessing the westbound on-ramp. The northbound lane beneath I-70 will be re-striped to carry two 11-foot lanes of traffic through the underpass around the north side teardrop roundabout, and then onto the I-70 westbound on-ramp. Engineers from the town and the Colorado Department of Transportation will be monitoring the new configuration throughout the week to determine if the trial period will be continued. Engineers estimate the two-lane travel will increase capacity by 30 percent at the interchange, helping to provide some relief to the weekday commuter congestion that has been occurring between 4:30 and 6 p.m. Motorists are asked to slow down, take turns and follow the new two-lane northbound striping and signage. Large trucks and buses will be required to use both northbound lanes to maneuver, so motorists are asked to yield to larger vehicles. The southbound lane of travel will remain one lane, narrowed to 12 feet. 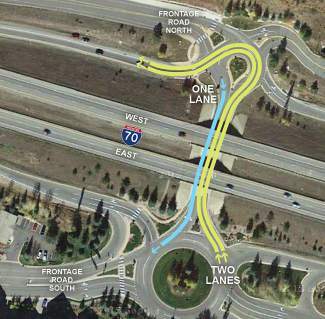 Since July 5, a new traffic pattern has been implemented on the north and south frontage roads to accommodate construction of the I-70 Vail underpass with one-way-only access through the project site. This re-routing of traffic has caused afternoon backups on the South Frontage Road between the two parking structures and at the Town Center, interchange. Engineers are also evaluating the impact of reversing the one-way frontage road access. The existing re-routing of the frontage roads is scheduled to continue until the end of November. During ski season, December through March, the frontage roads will return to normal traffic flow. • Encourage impacted employers to allow for a more flexible schedule, if possible. • If leaving from the Vail Village area, then go east to the East Vail interchange to access the interstate. • Consider carpooling, using the bus or bicycle to avoid and reduce traffic. • The in-town bus will not be picking up during congestion at the Marriott and Concert Hall Plaza; however, it will maintain its normal route from Golden Peak to East Lionshead Circle (near the Lionshead parking structure). • Note that it has been found that officers directing traffic in the roundabouts reduces capacity instead of improving flows as it would seem. For updated project information, go to http://www.codot.gov/projects/i70vailunderpass, or call 970-685-7706.